I really wanted to take advantage of being on my own for dinner and go to a couple of places I wouldn’t necessarily take my family. It was only four nights on my own but I made sure to go some place new or revisit someplace I hadn’t been in quite a while. Wednesday night of my week alone was going to be a short one. I had to pick the family up at the airport on Thursday so I needed to adjust my work schedule. Instead of going in at 9:30 AM, I went in at 3:30 AM. That meant I needed to get dinner and get to bed Wednesday if I was going to get any sleep at all. I left work right around 6:30 on Wednesday and headed down Michigan Avenue for dinner. There’s a bar that’s been in Kalamazoo for almost 100 years yet I still haven’t stopped in for a beer let alone something to eat. 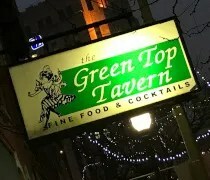 Green Top Tavern is on Michigan Avenue just to the west of Edwards and it’s been there since the late 1920’s. The tavern is an old brick building connected to the the buildings on either side. There is street parking out front but I chose to park in the paid lot behind the building near Bates Alley. I went straight for the bar when I got in. There were a few other people there but it was empty for the most part. The bar is stocked with the typical liquors as well as several taps. Many of those pulls are craft beers so there was quite a collection to choose from. 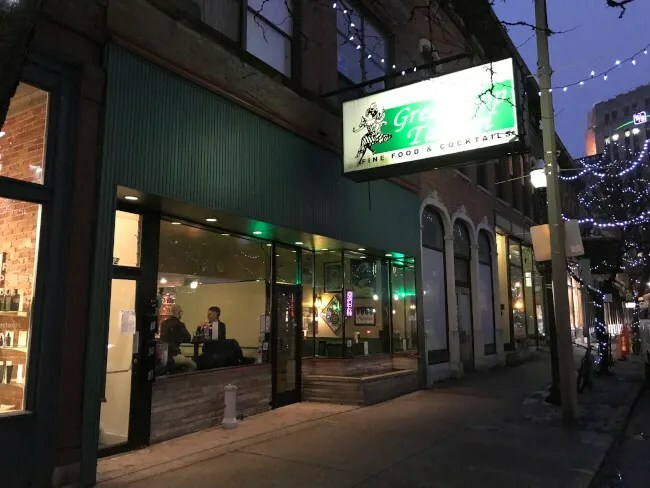 The Green Door is typically labeled as a dive bar and by downtown standards, that’s probably true. 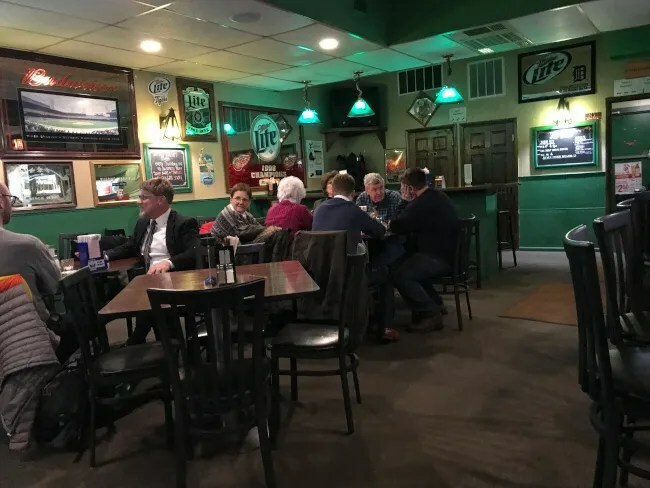 The decor is pretty basic consisting of mostly beer advertisement signs, the lighting is dim, and the furniture is a step above the torn leather padded chairs you typically find in a dive bar. The bartender just kind of pointed at me when I sat down so I asked for a Two Hearted. He started to walk away so I quickly asked him for a food menu. He grabbed one from near his cash register and set it down in front of me. 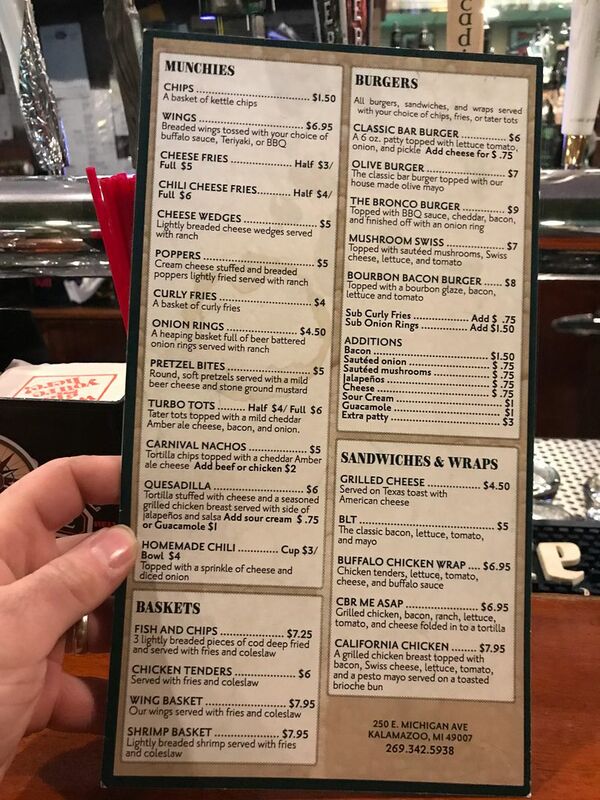 I wouldn’t label the menu “fine food” as the sign outside does, but I would call it pretty solid bar food with most of the staples. I ordered the Bronco Burger. This sandwich is a meat patty topped with bacon, BBQ sauce, cheddar cheese, and a couple of onion rings. 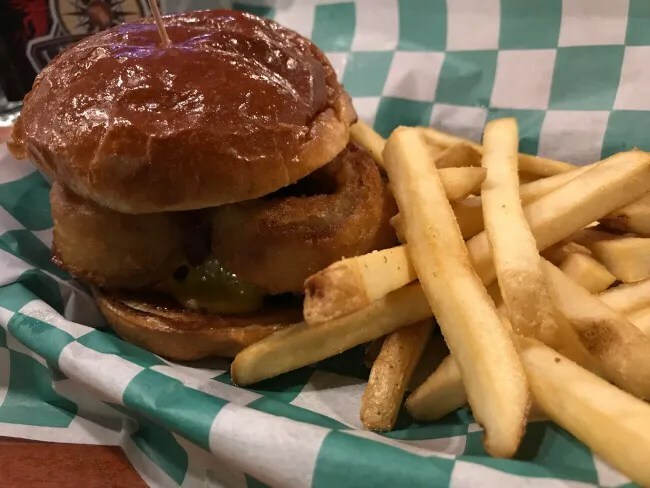 When the bartender set it down, it initially looked like a fried onion ring sandwich. There were three of them and they were quite tall. After a little searching, I found the patty underneath. It wasn’t small…it was just dwarfed by the rings. The sandwich is a really good pub burger. It isn’t fancy. It’s simple and it’s tasty. 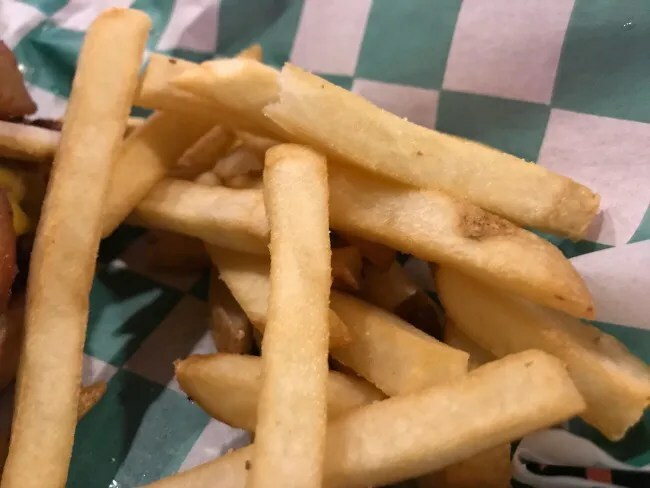 The fries are simple frozen skin-on fries. There was a bottle of mustard in the condiment caddy so I poured quite a bit of that on the paper liner and added a little salt. As far as frozen french fries go, these are the kind I generally prefer. My bill for dinner was right around $15 before tip. 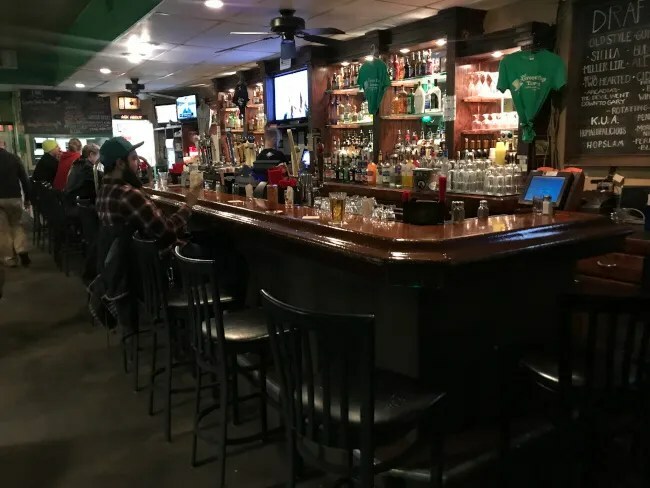 The Green Top Tavern has survived in Kalamazoo for so long because they do things right. It’s a simple bar in a hustle and bustle part of town. 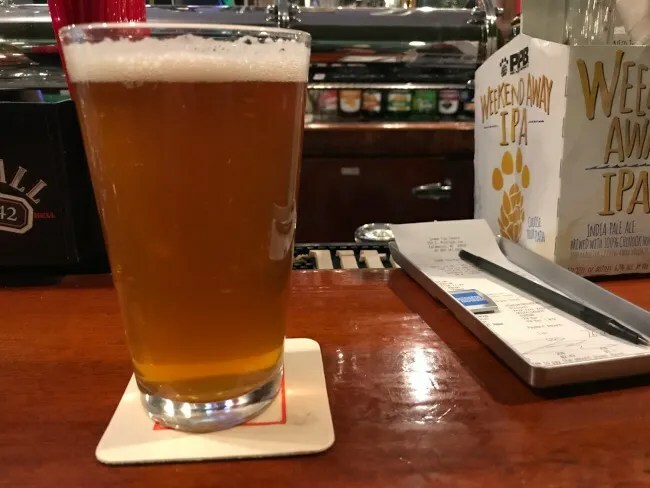 It’s surrounded by places with better ambiance, better food, and bigger drink selections, but sometimes it’s just wanting that simple experience of hanging out with friends while throwing back a few cold ones. Green Top is perfect for that as so many people have figured that out over the last century.